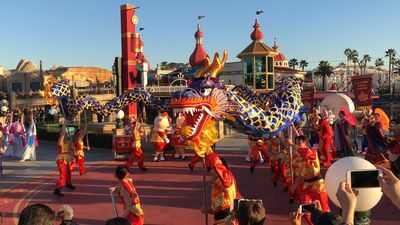 Our Lunar New Years update comes from MousePlanet columnist Todd Pickering, who spent a pair of days enjoying the festival at Disney California Adventure. 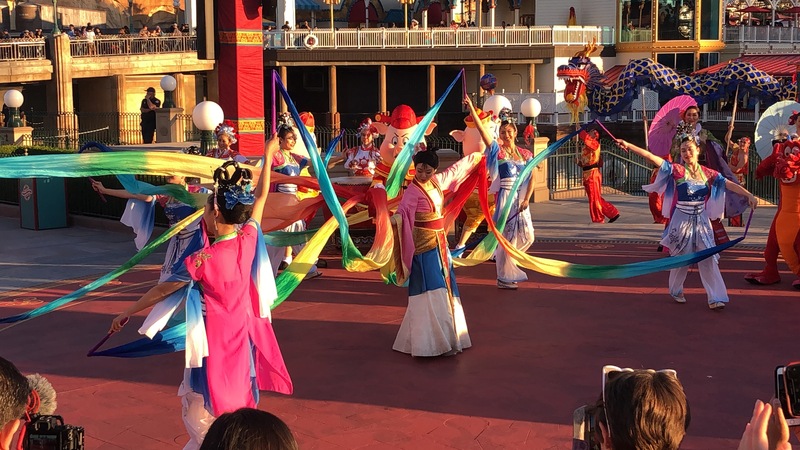 Lunar New Year is in full swing at Disney California Adventure park until Sunday, February 17. This year we usher in the Year of the Pig, which means Disney fans are treated to a rare appearance from Fiddler, Fifer, and Practical Pig (more commonly known as the Three Little Pigs) during Mulan's Lunar New Year Procession. 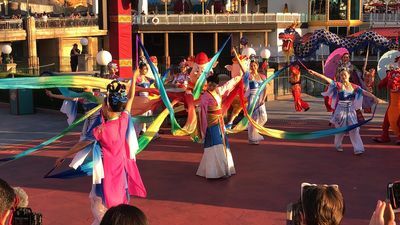 Mulan's Lunar New Year Procession is presented in Paradise Gardens Park this year. Photo by Todd Pickering. New this year is an improved location for the procession in Paradise Gardens Park, facing Pixar Pier. The procession is bigger and bolder than last year, with additional dancers, martial artists, and drummers. 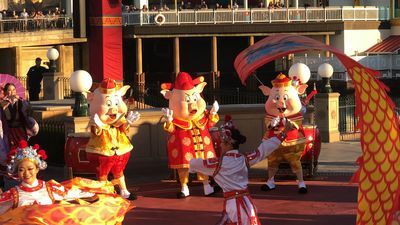 Along with the Three Little Pigs and Mulan, you will see Mushu, Goofy dressed as the "god of good fortune" and Chip 'n' Dale in their red vests. The change in venue provides more viewing room for the popular performance. Mulan, Mushu, Mickey, Minnie, and Pluto rotate through a photo opportunity near the Paradise Garden Grill. Unfortunately, Three Little Pigs are not available at this meet-and-greet. That 1933 contract must be solid! Those born in the Year of the Pig might have something to say about that. The Three Little Pigs appear in Mulan's Lunar New Year Procession, but are not available for photos with visitors. Photo by Todd Pickering. Along with the meet-and-greet are lots of crafts, including calligraphy, a Lucky Wishing Wall where you can post wishes for the new year, and performances from the trio Melody of China performing classical, folk and contemporary music. Vietnamese musical artist Dat Nguyen is a returning favorite—catch both acts at the Paradise Garden Bandstand. The dragon dancers are a popular part of Mulan's Lunar New Year Procession. Photo by Todd Pickering. Chef John State, the culinary director for the Disneyland Resort, says that Lunar New Year is his favorite celebration of the year from a culinary perspective. His passion for this festival shows in the menus of the many participating food locations. Four Festival Marketplace booths feature Korean, Vietnamese, and Chinese dishes, with a mix of returning favorites and new creations [click here for the full menus and pricing for the booths]. Disney is testing a new process this year that lets customers order dishes from all four Festival Marketplace booths at any booth, avoiding the need to stand in line to order and pay at multiple locations. Once you've ordered, you just take your receipt to each location to collect your dishes. Unfortunately, booths do occasionally run out of items, which may cause a problem if those out-of-stock situations are not communicated quickly to every booth. We'll see how this works out this year, and definitely want to hear from you about your experiences with this new method. 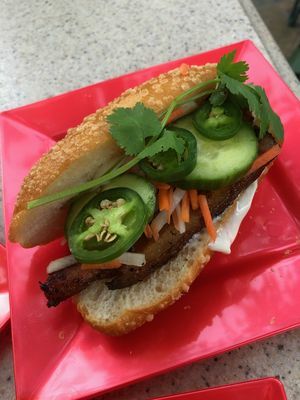 A banh mi sandwich from Paradise Garden Grill. Photo by Todd Pickering. Also new this year is the Lunar New Year Sip and Savor pass, which retails for $39 ($36 for Annual Passholders) and includes six tabs. You can use the tabs for non-alcoholic items at the Festival Marketplace booths, which offers a slight discount over purchasing the six most expensive items a la carte. In another twist, the Sip and Savor pass is also valid for selected menu items at the Paradise Garden Grill, and at the Festival Food & Beverage Cart. This cart serves up Gochujang Chicken Wings and Mini Almond Cookies. As always, we recommend that you use your tabs for the entrées, and pay out of pocket for desserts—your savings drop each time you use a tab on an item priced under $6. 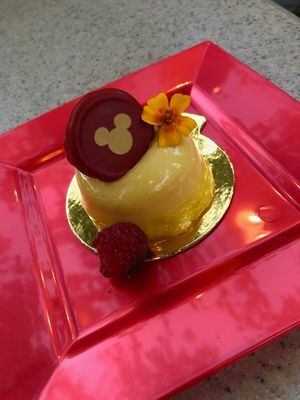 The mango mousse is sold at Paradise Garden Grill during the Lunar New Year festival. Photo by Todd Pickering. The Korean Steamed Short Rib Shumai at the Red Dragon Spice Traders is fantastic. Two dumpling purses are stuffed with slowly braised short ribs that just melt in your mouth and are bursting with flavor. The crunchy cucumbers cool the spicy sauce. Anything from this booth is on the spicier side but on a heat scale of 1 to 10, we would give it a 5. The Vegetable Egg Roll and Chilled Sesame-Garlic Noodles from the Longevity Noodle Co. has an amazingly light cilantro-cashew sauce with toasted peanuts. It's more of a glaze and brings out the flavors nicely. The egg roll is nice—hot and crispy on the outside and lots of flavor on the inside. The sesame-garlic noodles are chilled and beautifully flavored. Not one ingredient is the dish is overpowering, resulting in a lovely balance. The Vietnamese Banh Mi from Paradise Garden Grill is delicious. The grilled pork belly is cooked to perfection and is juicy and tender. The jalapeño is sliced big enough so you could take it out if you wish, but Chef John State suggests trying a little taste to see how the mayonnaise and cucumber in the sandwich balance the heat. 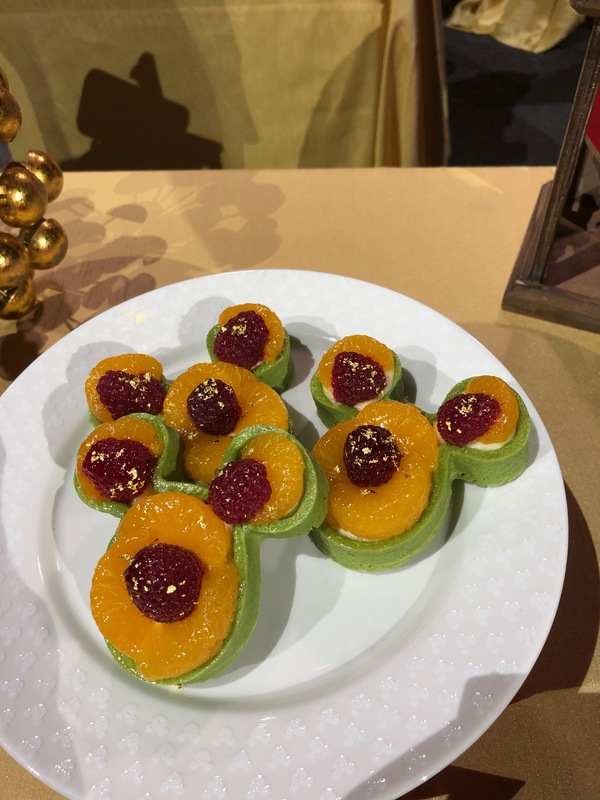 The green tea Mandarin tart is available from the Lucky 8 Lantern. Photo by Todd Pickering. The Asian desserts are not overly sweet. We got to try the Raspberry Lychee Chia Tea which we did not find overly sweet but I would enjoy this more as a treat. The lychee, chia seeds and a sprig of mint gives this non-alcoholic beverage a soft and luxurious flavor. You can't go wrong with the traditional egg tart. The whimsical Mickey Mouse-shaped tart had a beautiful green tea pastry shell that was flaky and baked to perfection. The green tea was just the right amount to not overpower a subtle pastry cream that let the raspberry and orange steal the show. A mango mousse topped with a lucky white chocolate red coin with Mickey Mouse ears bursts with color and flavor, and the passion fruit inside is fresh and fruity. 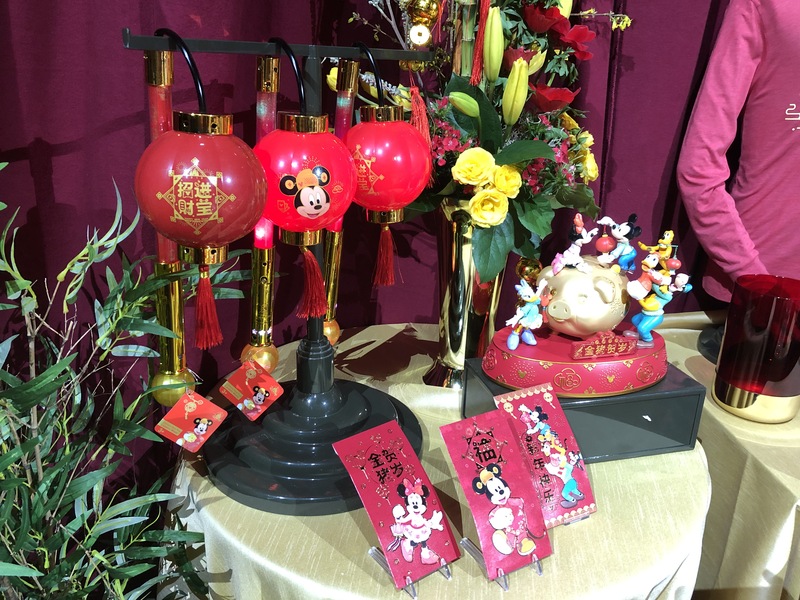 The Lunar New Years assortment includes special commemorative items from Shanghai Disney Resort, including traditional red envelopes for gift-giving, Minnie Mouse ear headbands and our favorite, the lantern glow wands. There are also some great T-shirts and hoodie designs with your favorite Disney characters. 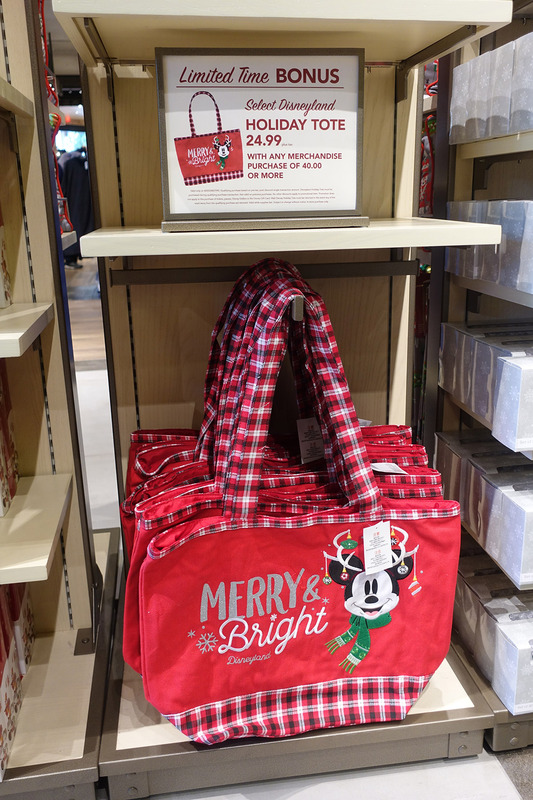 The merchandise selection expands each year, and for 2019 includes a Year of the Pig figure with Mickey and friends. A sampling of the Lunar New Year merchandise available at Disney California Adventure. Photo by Todd Pickering. 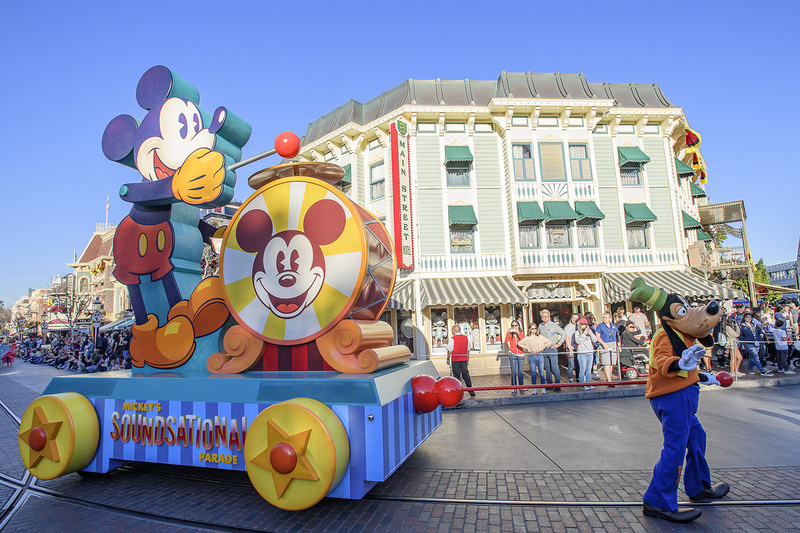 Mickey's Soundsational Parade returned to Main Street, U.S.A. last week with two new floats joining the lineup as part of the Get Your Ears On promotion. The first is an oversized birthday cake for Mickey and Minnie, who are celebrating their 90th year. 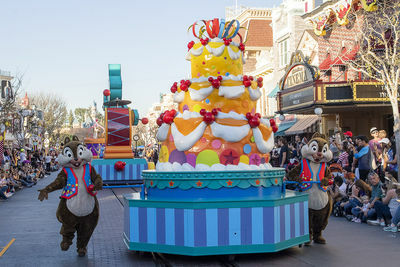 Chip and Dale push the cake. Chip and Dale lead Mickey's Soundsational Parade with a jumbo birthday cake. Photo © Disney. The second float comes from Tokyo Disneyland, but was created by the Anaheim-based design duo of Kevin Kidney and Jody Daily. The pair said the float was inspired by a vintage pull toy in their collection. Goofy tugs this float down the parade route, though he often gets sidetracked by members of the waiting crowd. 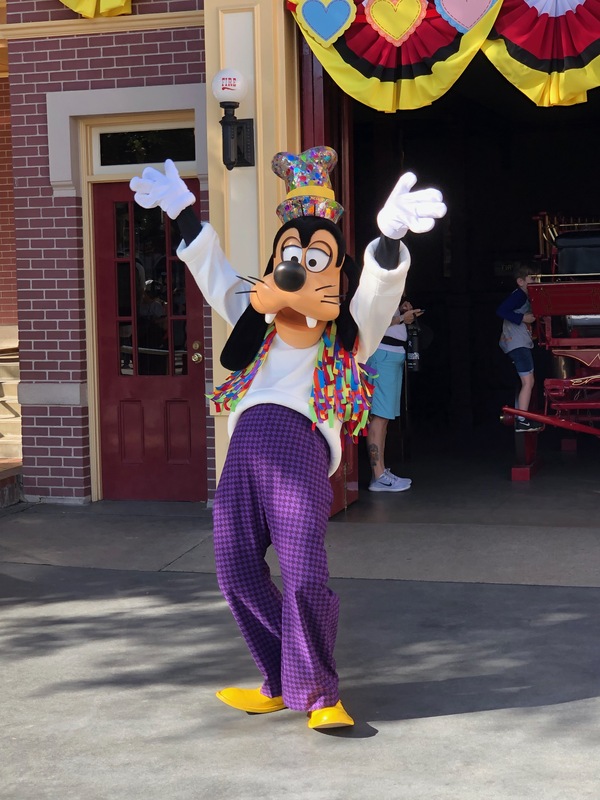 Goofy pulls a new Mickey Mouse float in the updated Mickey's Soundsational Parade. Photo © Disney. The two new floats have not displaced the parade's lead float, which features Mickey Mouse drumming live along with a marching drum line. 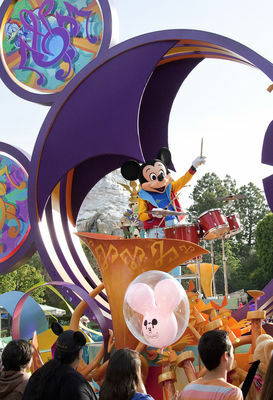 Mickey's Soundsational Parade is performed daily at Disneyland. Mickey Mouse leads Mickey's Soundsational Parade at Disneyland. Photo © Disney. Later this year, Disneyland will host what could be its biggest opening since 1955, as Star Wars: Galaxy's Edge welcomes the first guests to the fictional planet of Batuu. 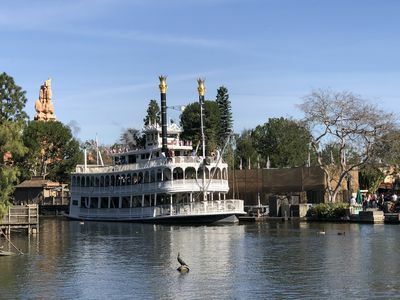 There's no telling how many fans will flock to this "remote outpost on the galaxy’s edge," but the Disneyland Resort has spent the past two years preparing for their arrival. Last week, Disney hosted a small tour of Disneyland park to provide a look at projects already completed, and discuss those still to finish before Batuu welcomes the first visitors. 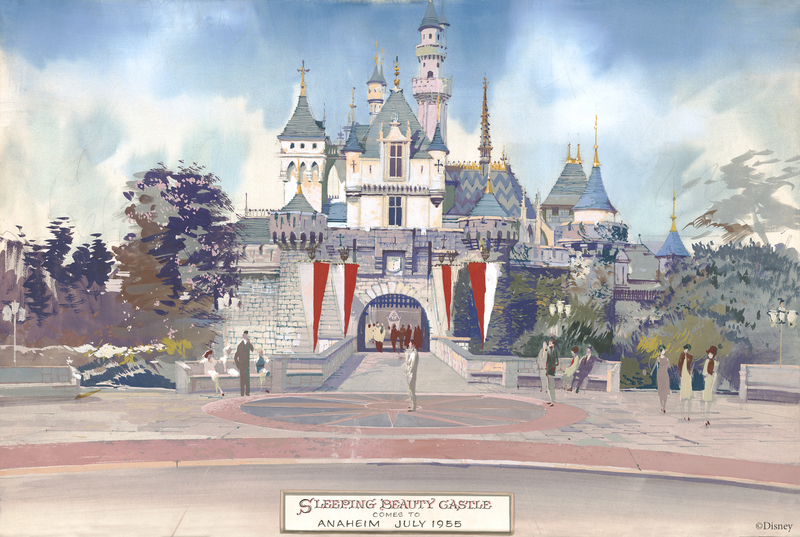 You can read all about Project Stardust in our article, Star Wars meets Pixie Dust: Disneyland prepares for the future. 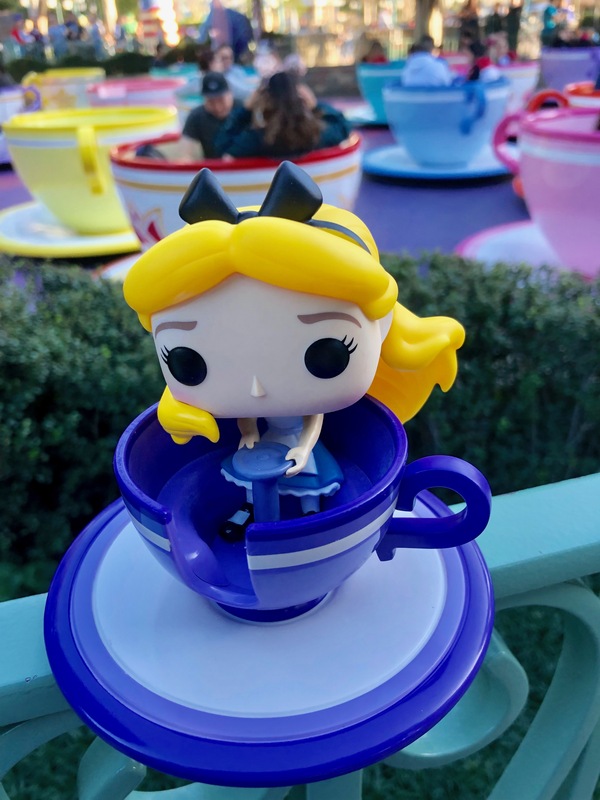 The Mad Tea Party Funko POP! figure was released at the Disneyland Resort this weekend, and will be available on the ShopDisney.com website on January 28. Photo by Todd Pickering. Goofy shows off his new costume on Main Street, U.S.A. Photo by Todd Pickering. ...Fantasmic is scheduled to return to Disneyland on Friday, March 8 following a brief annual refurbishment. When the show returns, the Rivers of America will provide another viewing area for Mickey's Mix Magic, with scenes from the new nighttime show animated to take advantage of the Fantasmic mist screens. The Mark Twain is operating during refurbishment of the Frontierland loading area. Photo by Todd Pickering. Astro Orbitor – closed for refurbishment. No reopening date announced, but after March 10. Sleeping Beauty Castle Walkthrough – closed for refurbishment. No reopening date announced, but after March 10. Sleeping Beauty Castle Enchanted Chamber – closed for castle refurbishment. No reopening date announced, but after March 10. Fantasmic – closed for refurbishment. Scheduled to reopen March 8. "it's a small world" – closed through January 31 to remove the holiday overlay. Space Mountain – closes February 25 for refurbishment. No reopening date announced, but after March 10. Grizzly River Run – closed for refurbishment. No reopening date announced, but after March 10. Silly Symphony Swings – closes March 1 for refurbishment. No reopening date announced, but after March 10. We saw the first Soundsational parade on Saturday, and Mickey wasn't drumming. He was standing on the front right on the float, where Minnie usually stands, and she was walking along with Pluto after the float. One of the guys from the drumline was drumming where Mickey usually is.